No matter what you're wearing. It always welcomes you with open arms. It lives with four feet firmly on the ground and its arms are always wide open for something new. And if things get too much for it ... it has a big brother! We are talking about our hood clothes rack, whose slender frame brings to mind a tall tree with its sweeping crown. The interplay of angular and rounded shapes makes it a versatile piece which is a welcome guest in all kinds of entry halls. With its expansive arms, hood offers generous space for jackets and coats, as well as convenient hanging points half way up for bags and other items. 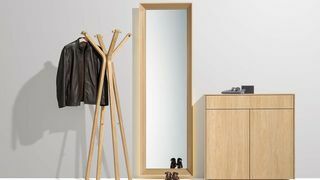 When two basic units are connected with a rail, hood becomes hood+ with a width of 110 or 130 cm, adding up to a generously-sized clothes stand for the entry hall or bedroom. Small helpers that make for a great performance. They aren’t in the limelight, but they’re the actual stars of the entry hall: small everyday helpers such as shoehorns and clothes hangers that we regularly use. One more reason to give them a grand stage while making sure they are comfortable to the touch. Made from a single piece of solid wood, our clothes hanger makes a highly sophisticated impression. It doubles as the perfect hanger for guests’ clothing and a decorative accessory. The elegant styling and first-class workmanship of the shoehorn also make it a designer item. Solid wood gives the slender design great stability and weight-bearing capacity. The centrepiece of hood is a node where the individual elements all meet. In this spot, the craftsmanship and naturalness of the materials is especially palpable. Likewise, the fact that loving attention is given to fine detail in hood’s creation is palpable in the piece’s tapered mandrels. Ingeniously formed of solid wood, they offer a secure hold for garments and clothes hangers.